In the aftermath of a devastating tragedy the Tree of Life synagogue in Pittsburgh is suddenly the most well-known shul in America. As you know a crazed madman with Jew hatred in his heart attacked worshipers at the shul last Shabbos morning just before 10 a.m., killing 11 people and injuring six others. The debate about whether he was more of an antisemite than a mentally or emotionally unbalanced individual will in all likelihood continue for a while. The massacre in Pittsburgh was not a watershed moment in the emergence of national targeting of Jews. Unfortunately, there are many – in the United States, Israel and Europe — who are calling this the “beginning of the end” for Jews in America. Among those who will profit most from the idea that Pittsburgh’s massacre is a signal of a downhill spiral for Jews in this country are the mainstream media. The sad reality is the wholesale murder of Jews in the context of the Holocaust draws extraordinary attention, hence the very detailed and comprehensive coverage. Nassau Police Commissioner Patrick Ryder and Lawrence Deputy Mayor Michael Fragin. On Monday night there was a meeting in Woodmere with some of our elected officials and Nassau County Police Commissioner Patrick Ryder. The commissioner seemed well versed in the uniqueness of the Jewish communities in our county and expressed a depth and understanding of our distinct needs. He said right up front that he believed the attack in Pittsburgh was more about mental illness than antisemitism and many agreed that was indeed the case with the mental imbalance taking the lead and pulling the assailant’s Jew hatred along for the ride. The key to crime fighting in general these days, and to hate crimes targeting Jews, is communication. That was the first issue the commissioner addressed. How, he asked, can there be an open channel with the many Orthodox shuls in the county if members do not carry their phones or use electronic communications on Shabbos? Obviously, being left in the dark as far as communication with police is concerned needs to be dealt with immediately, and it looks like that is precisely what is happening. Community leaders at the meeting made two suggestions to work within halachic limitations. One was to hook the police department into the electronic message boards most shuls have these days. The was for police to communicate with shul membership on Shabbos through Hatzolah, whose members are present in most shuls on a regular basis. Another meeting participant pointed out that in the aftermath of the Pittsburgh shooting, the NYPD is in the process of hooking into the Hatzolah network as a way of maintaining open communication with shuls on Shabbos in case of an emergency. Our local elected officials were present at the meeting and pledged their commitment to protecting the community from those bent on doing harm. Nassau county Executive Laura Curran told those assembled that her office is dedicated to protecting our First Amendment right of freedom of religion. State Senator Todd Kaminsky said our community is a target; if a bad guy is looking for a yarmulke, this community is one of the places he will find it. He also said that he has been in touch with Governor Cuomo who said resources will be made available to the community. Congresswoman Kathleen Rice told those assembled, “People need to feel safe when they are worshiping.” She said that though there has been talk in Washington D.C. about cutting some federal funding for security resources, she is committed to making sure that there are no such cuts here. As far as what the police department is doing, Commissioner Ryder said Nassau County works in tandem with the NYPD and the FBI and has a staff of 50 working on intelligence seven days a week. He said the county has under surveillance about 25 people who are considered sources of potential danger. The commissioner said the highest technological equipment is being used, including license plate readers that can identify which cars in a neighborhood are not usually present and therefore deserve a bit more attention. Ryder talked in detail about police procedures in an active shooter situation, but it does not make sense to present those details here. Overall, he said antisemitic incidents are down over the past year in the county and the department is dedicated to seeing the numbers continue to decline. 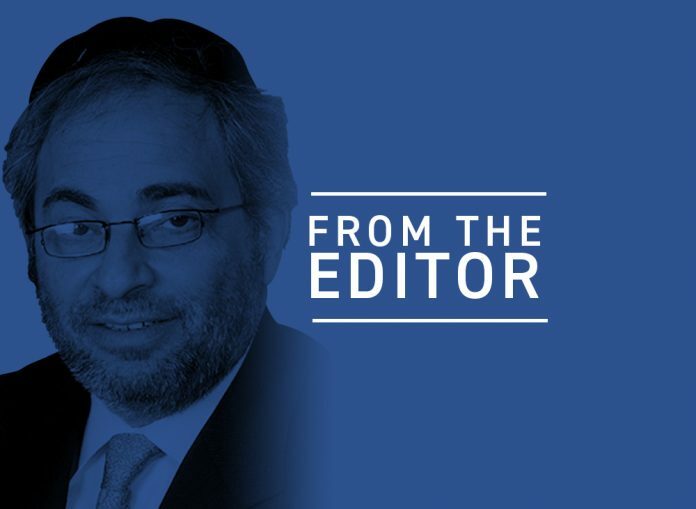 Police officers are visiting 750 religious institutions in Nassau County every day, including yeshivas, shuls, and other religious institutions. Ryder also covered the protocol for those carrying guns in shuls, hiring armed security guards and how those folks should be communicating with police. Bottom line, he said, is that we cannot afford to sit back and be victims. There are 2,500 police officers in the Nassau County Police Department. After Tuesday night’s meeting, the community can be assured they are working with us in a manner that is closer, involved and more intimate than ever before. Next articleWill Nikki Haley Enable Qatari Agent Immunity From Prosecution?